Algonquin College duo steps atop the silver podium. The competition provides real-world experiences for students. The 2018 Ontario Skills Competition took place May 7-8, at the Toronto Congress Centre in Toronto, Ont. 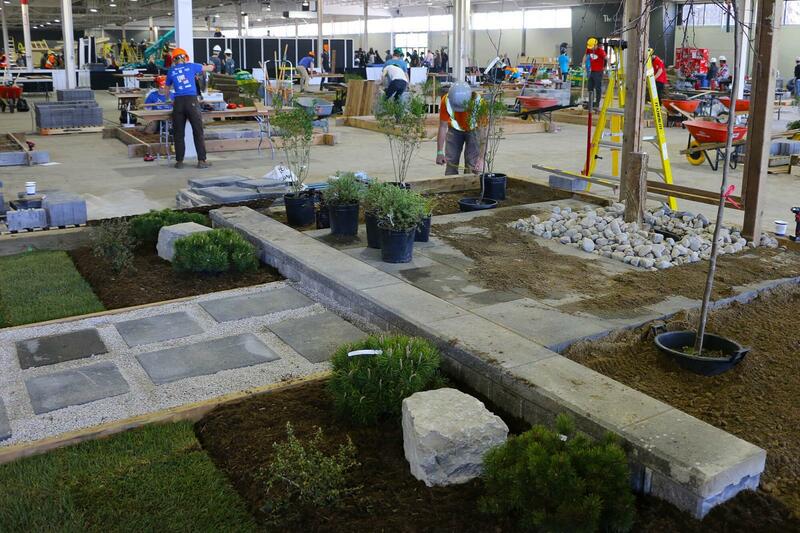 The largest skilled trades and technology competition in Canada, Skills featured both secondary and post-secondary students from across the province competing in a number of various skilled trades, including categories for Horticulture and Landscape, and Landscape Design. This year saw an excellent showing from all competitors. Despite a few hiccups along the way, it was encouraging to see competitors step-up and conquer challenges head-on. For this event to even be possible, members of the industry also step up to the plate — providing their time, product, supplies and resources needed to put on a competition of this scale. Thank you to the following sponsors who continue to provide the resources needed to host this event: Permacon, Connon NVK, Milwaukee Tools, Battlefield Equipment, Stihl Canada (and Steve Anderson for his continued help supervising the saws), Creative Landscape Depot, Grand River Natural Stone, Snap Edge Canada/Great North Landscape Supply, Compact Sod, TNT Property Maintenance, and FSI Landscape Supply. The Horticulture and Landscape, Post-Secondary competition featured seven, two-person teams from across the province work hard to complete a two-day build. Winners are: First place, Thomas Hawley and Blaise Mombourquette, Algonquin College; second place, Andrew Campbell and Tianna Ghersini, Durham College; third place, Connor Hockley and Kevin Willcox, Humber College. The Horticulture and Landscape, Secondary school competition had 13 teams of two compete to complete their build in just one day. Winners are: First place, Antonio Carvalho and Nicholas Braga, St. Joan of Arc Secondary School (Dufferin-Peel Catholic District School Board), second place, Anton Niemi-Fielding and Colin Therrien, Lo-Ellen Park Secondary School (Rainbow District School Board); third place, Arcindo Costa and Michael Gomes, Archbishop Romero Catholic Secondary School (Toronto Catholic District School Board). Winners for the two-day, Landscape Design, Post-Secondary competition are: First place, Rachel Radauskas, Fanshawe College; second place, Terri Carroll, Niagara Parks Commission School of Horticulture; third place, Haley Johnston, Humber College. Winners for the one-day, Landscape Design, Secondary competition are: First place, Hazel Barredo, Mary Ward Catholic School (Toronto Catholic District School Board); second place, Fiorella Granda, Holy Trinity Catholic Secondary School (Halton Catholic District School Board), third place, Adiva Saadat, White Oaks Secondary School (Halton District School Board). Thanks also to the support from Landscape Ontario, as well as committee members and judges for supporting the event that continues to enhance the industry through recognizing the skills of future employees. Judges: Steve Neumann, Mark Dawson, Candace Lapointe, Alex Foster, Erin Carey, Michael Garcia, Brandon Gelderman. Thanks to Shane Jones for completing the designs for the competition and co-chair, Eckhard Lutz, master of the judging program and to Rob Tester for his dedication and support that makes this event such a success. The 30th annual Skills Ontario competition will take place in 2019. If you are interested in joining the committee, please contact Sally Harvey at sharvey@landscapeontario.com or Rob Tester, Horticulture and Landscaping Technical Chair, at rob@tntpropertymaintenance.com. Students hard at work in the landscape design competition.